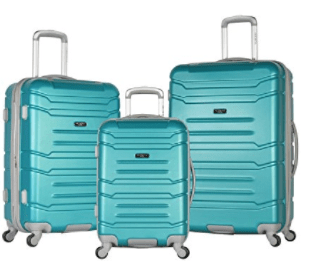 Olympia Monarch HF-2200-3 is a modern luggage set of three hard side spinner suitcases that measure 20, 24 and 28 inches.You have six color options of black, navy, purple, teal, white and wine to select from. White and green are the lowest priced colors with the rest significantly higher. One of the customers pointed out that the largest 28-inch suitcase had a few scratches on their first trip and they have the white set, so this is something to keep in mind if you’re planning to get white. It is an imported luggage set from a country where labor is much cheaper but is stocked in the US so shipping is often quite fast via Amazon.com. 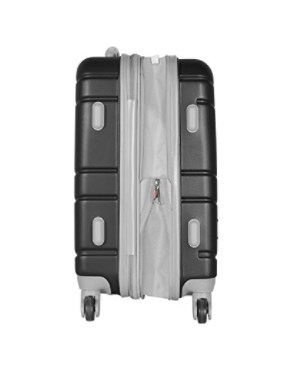 The three suitcases have the standard features like the fully padded fabric interior lining that is nicely imprinted, hard shell exterior- made of solid ABS material, four spinner wheels, and push-button metal telescoping handle. The 4 solid plastic spinner wheels let you roll the bags quickly and easily with zero weight movement in multiple directions. Aluminium telescoping handle is good quality, feels sturdy and durable and makes it easier for both shorter and taller people. Apart from the retractable handle, they have a top handle, a side handle and a bottom grip handle. There is a mesh zip pocket on the left-hand side, a divider with shoe pockets and a buckle tie belt. You will also find a removable transparent vinyl 3-1-1 wet zip bag on the right-hand side, where you can put your small items in. These three suitcases are all expandable to give you extra packing or storage capacity. There is even a patented hidden section in the expandable part of the suitcase but this is only in the cabin size luggage. The shipping weight is 30 pounds (all three bags are lightweight) and the product shipped measures 11.5 x 19 x 29 inches. You will get the all three fitted into each other: Small into the medium and medium not the large. They are all spacious inside with different pockets and zippers, especially with the additional expandable capacity. But it may be a little hard to fit the cabin luggage when expanded and full, in the overhead locker on the plane. And about the locks, we are not able to locate the TSA locks on these bags, so they may or may not be available with this model. They look good with a beautiful modern design, are lightweight, built sturdy and durable (will hold up well over many travels), functional and user-friendly. There is even a laptop compartment in the cabin bag that you can get in without having to open the whole thing. You get many years of warranty with Olympia luggage sets and please contact the seller directly about the warranty information for this model. They seem to offer good value for money but please pay attention to the very big price difference between different colors. In your review, you state the luggage set comes with a 10 year warranty; however, when I viewed the amazon site to which your review directed me, I didn’t see a reference to a warranty. On the Amazon site and in the section called “Have a Question,” I posed my warranty question. But it didn’t seem to go through. How can I be sure the luggage comes with the 10 year warranty that your review references? Hi, the warranty information is from other retail websites. You can contact Olympia USA directly on info@olympiausa.com to make sure. Thanks.